After more than an hour of deliberations ESBC Planning Applications Committee gave permission for the revised proposal by Westbury Homes to develop the Burton College Rolleston Campus, including the change of use of part of the playing fields, at their meeting on Monday 28 January 2002. Opinions were divided and committee members were split 50-50 for and against the homes plan. A casting vote in favour of the scheme came from acting chair, committee vice-chairman John Galbraith. Members absent: Peter Davies (Stretton Ward) - Chairman of Planning Applications Committee, Penny Perry (Burton Ward) and Peter Beresford (Shobnall Ward). The site meeting held earlier in the day was attended by over 50 objectors who raised their concerns over safety, including the location of the proposed play area near to a pond, and that the plans were not in keeping with requirements of the village design statement stipulated in the design brief. Marek Trelinski, East Staffordshire councillor for Rolleston and chairman of Rolleston Parish Council called for the housing proposals to be redesigned to be more in keeping with the village. He said the development made a mockery of the village design statement, a document drawn up to preserve the character of the village. A campaigner has called for a decision on plans to build 89 houses on a former college campus to be deferred until Ofsted has reported the findings of its inspection of Staffordshire LEA. Ken Green submitted his own report to inspectors during their review of the LEA calling for a secondary school on Burton College's Rolleston Campus. In the report, which has also been submitted to the Audit Commission and ESBC, Mr Green says there is a shortage of secondary education places in Burton which could be solved by a new school. He says the shortage was sparked by the closure in 1985 of the Forest of Needwood School which stood on the site. Now the proposed development and associated plans to convert neighbouring playing fields into public open space is being recommended for approval and looks set to be accepted by the council's planning application committee on Monday (28 January). The housing scheme has been opposed by parish councillors and residents who feel it is out of character with the village. Rolleston Parish Council claims the developer has ignored the village design statement. It feels the playing field plan is a bid by Westbury Homes to compensate for failing to provide the open space and play area space expected of them within the development. Proposals for the seven-acre plot include 89 houses ranging between five and one-bedroomed homes of which 27 will be three-storey, 19 will be 2.5 storey and the remainder two storey. An amended planning application for 90 houses on a former Burton College campus includes only minimal changes and completely ignores the village design statement, councillors say. Now Rolleston Parish Council may consider going to appeal, claiming the developer has completely ignored their vision for the area. Housing developer Westbury Homes has resubmitted plans for 90 houses on the Burton College Campus in Rolleston to ESBC. The firm already has outline planning permission for the scheme which is expected to be decided by the authority's planning committee in January. Discussing the amended application at a parish council meeting this week, councillors said they were 'appalled' by Westbury's apparent intentions to ride roughshod over the parish council's views. Councillor Ken Bradley said 'It seems ludicrous that this planning guidance design statement, that people in the village took so much time on and which was well received by ESBC as well as achieving a certain amount of national recognition, and which should have been used here for the first time, has been ignored. I would expect ESBC to take the design statement into account. There are very minimal changes here and if anything it has got bigger. The changes include some of the houses increasing in overall size.' The parish council will again strongly object to these plans and Councillor John Morris called for the council to consider appealing against the ignoring of the design statement guidance. Councillors also expressed annoyance that Westbury had not acknowledged concern over the skyline with the three-storey houses, problems of off-street car parking, or requests for affordable housing and a mixture of houses and bungalows. Residents have objected to the homes plan and a separate application to turn part of the former school playing fields at the site into open space to serve the housing development. They said the housing developer was trying to 'off-load' its responsibility of providing a children's play area on the housing site by trying to develop a nearby area of land, and it was now trying to push through the two together at planning committee. ESBC planning committee decided at their meeting on Monday 5 November 2001 to defer their decision over the plan to turn part of the Rolleston Campus playing field into open space so that it can be considered alongside the application for 90 dwellings on the adjoining site - either at their meeting in December or January. Reserved matters application (received by ESBC) for the erection of 90 dwellings including details of siting, design, external appearance and landscaping, Burton College Rolleston Campus for Westbury Homes. Representations needed to have been made to ESBC by 2 November 2001 at the latest. Check out ESBC Planning Applications here. At the public meeting held on 15 October planning consultant Alf Plumb advised local residents on what he considered were possible reasons for opposing this application. He however warned residents they could not oppose it on the grounds that they did not want a housing development (the site had already been given outline planning permission for housing) nor on the number of dwellings (which fell within government guidance). Concerns raised included lack of essential detail concerning building levels, the poor overall layout of the site, conducive to crime, excessive number of three storey buildings not in keeping with village appearance (village design statement), safety/access issues relating to on-street parking, infrastructure inadequate for further development on adjoining playing fields, lack of landscaping/screening (especially to the south), overlooking properties (loss of privacy), proposed play area to the south should be incorporated within the main site for reasons of safety/access. (Letters should have been sent to Mr A Wood, Head of Development Services, ESBC, Midland Grain Warehouse, Derby Street, Burton-on-Trent, DE14 2JJ). Thanks to the artist wizardry of a local resident, here are two aerial views - one gives the campus area minus buildings (a true green field site!) whereas the other gives an idea what the proposed housing density would look like in relation to the surrounding houses. This is before roads, roundabout, toddlers play area, garages or other facilities proposed on the plan have been added. 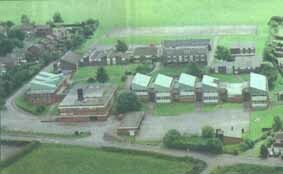 Regular readers of the Rollestonian will be aware of the tremendous efforts made by their Parish Council and other representative bodies in the village, in trying to persuade the Staffordshire County Council to reintroduce the, shortly to be vacated, Rolleston Campus educational assets into the County's secondary education system. At the same time as these efforts were being made, readers may also like to know that, as a private individual, and non-Rollestonian, I was also taking the educational case to the County Council. The main difference between my efforts and those of your local representative bodies being that, my terms of reference were based upon the current poor and deteriorating levels of education provision in the whole of East Staffordshire and in Burton on Trent and its surrounding villages in particular. To say that no stone was unturned in presenting the arguments in support of the case for returning the Rolleston site to secondary use would, I think, be an understatement of monumental proportions. Presentations were made at local level to the County Council through Staffordshire Schools Organisation Committee, the Director of Education, the Council's Education Leader, every East Staffordshire County Councillor, every East Staffordshire Borough Councillor, all Councillor members of the Planning Applications Committee and every East Staffordshire Parish Council. At national level, presentations were made to Janet Dean MP, the Department for Education and Employment, the Department of Transport and the Regions and even direct to the Prime Minister himself. It was clear from the onset that presentations at County Council level would prove fruitless but, as this is where the responsibility for education provision primarily lies, these had to be made. What was totally frustrating was that, representations to the higher levels of national authority simply resulted in a "washing of hands" approach in that one was referred back to the non-listening County Council. "The law does require that any complaint which the Local Government Ombudsman investigates is from a citizen claiming injustice from maladministration. We take that to mean some fairly direct effect and this is not the case here. You are in essence campaigning on behalf of the public which is fine, but you lack the direct potential injustice that we need." So there you have it. Unless some parent, or better still group of parents, directly affected by, what I consider to be maladministration of the education system in East Staffordshire, is prepared to take up the cudgel then the local authority is 'fire proof' (except perhaps at local election time). As recent press reports have confirmed, the situation in education provision has deteriorated further this year even when compared with the extremely serious overcrowding position last year. It is my view that matters will only worsen. The special status of the former de Ferrers High School may be good news for the school but this, combined with further housing development to the west of the A38 corridor and across the border in neighbouring Derbyshire can only place greater and greater demands on the school and eventually of course on other Burton schools. It has now been revealed that the College is in discussion with the new LEA director, Jenny Hawkins, about the possibility of using part of their Rolleston site for a community school as well as housing! "An act of vandalism" - Rolleston Liberal Democrat Councillor Marek Trelinski's opinion, like many others, of the decision by East Staffordshire Council's planning applications committee - only a few hours after the site meeting (9 October 2000) - to approve the outline application by Burton College to build around 60 homes on the Rolleston site. College principal Keith Norris welcomed the decision which he said would benefit hundreds of people. The subsequent resolution to permit the plan itself was not a named vote. The Burton College site inspection on Monday 9 October 2000 (regarding the application OU/02863/14 for residential development) was attended by well over 100 protestors despite the terrible weather. A number of issues were raised at the meeting - the primary concerns being the loss of educational facilities, and although not directly covered by this particular proposal, the future of the linked playing fields. Concerns were also raised that the applicant had already been in talks with the council offering to part fund a sports hall on council land. Another issue mentioned was the fact that both the Chief Executive of ESBC and the Director of Education were on the governing body of the college. Ken Green has produced a selection of policies and principles from the recent School Organisation Plan for Staffordshire upon which you may wish to comment or ask questions of the LEA. The actual plans are detailed here. If you have formally complained to the authority and not received a satisfactory reply, then you have the right to appeal to the local government ombudsman in certain circumstances. They can only investigate certain issues such as personal injustice as a result of maladministration. The address to write to is Mrs P A Thomas, Local Government Ombudsman, Beverley House, 17 Shipton Road, York YO30 5FZ (Tel. 01904-663200). Adviceline - 0845 602 1983. A controversial expansion drive by Burton College has been dealt a blow after councillors put the first phase 'on hold’ for further investigations. The college wants to axe its campus in Rolleston to make way for 60.homes and move nearly 1,000 students to Burton. East Staffordshire Council's planning applications committee deferred the bid at a meeting yesterday for further talks to go ahead, especially with parish councils. Thirty protesters from Rolleston and the surrounding area attended the meeting at Burton Town Hall. Councillors overturned a recommendation by planners that the scheme should go ahead. Under subsequent phases the college wants to build an annexe at its Lichfield Street site and then sell off the playing fields at Rolleston to make way for a further 150 homes. Campaigners say the site is needed for another school to cater for an extra influx of children. Committee member Councillor Wally Hodson-Walker, who is also chairman of Rolleston Parish Council, said: "The figures show that East Staffordshire faces massive overcrowding in secondary education.We need an extra secondary school." Tory Group leader Alex Fox said there had been an overall lack of consultation with parish councils. He said: "Let's have everything out in the open.It is a major issue, not just for the people of Rolleston but also the people of Stretton, Shobnall and Outwoods." Meanwhile, Rolleston Parish Council has threatened to take the case to the Local Government Ombudsman over the way the proposed development has been handled. One controversy surrounds an offer by the college to build a new sports hall on the council run Shobnall Fields. In a report to councillors, Staffordshire chief education officer Dr Philip Hunter says the reopening of the former Forest of Needwood High School is unlikely to be feasible. Dr Hunter, who is on the college's governing body, says secondary numbers in the Burton area are expected to rise for the next five years but then start to fall back. Contact: Mike Waldron, Principal Planning Officer, ESBC (email: mike.waldron@eaststaffsbc.gov.uk ). According to the report Burton College is to spend £3.5 million on a new block in the centre of town, centralising all teaching and educational facilities. To fund the project the college's six-acre Rolleston campus site is to be sold off for housing. Later the college hopes to sell off the adjoining 15 acre playing fields for more housing. Formal planning applications for the Burton and Rolleston developments have been submitted to East Staffordshire planners. Subject to planning approval, the existing Rolleston campus buildings will be demolished to make way for around 60 homes. In addition the college authorities will try to get the adjoining playing fields earmarked for housing in the next local plan, making way for around another 150 homes.